With fall just around the corner I put together a sensory bin full of apple scented water beads. 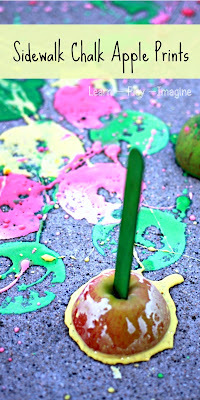 For added sensory play I dyed them green, red, and yellow like apples. Last fall we were a bit obsessed with the apple scented play. 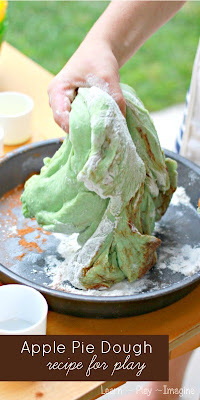 With our apple tree in bloom I'm in the mood for some more apple inspired fun! We love water beads and have played with them in many different ways. 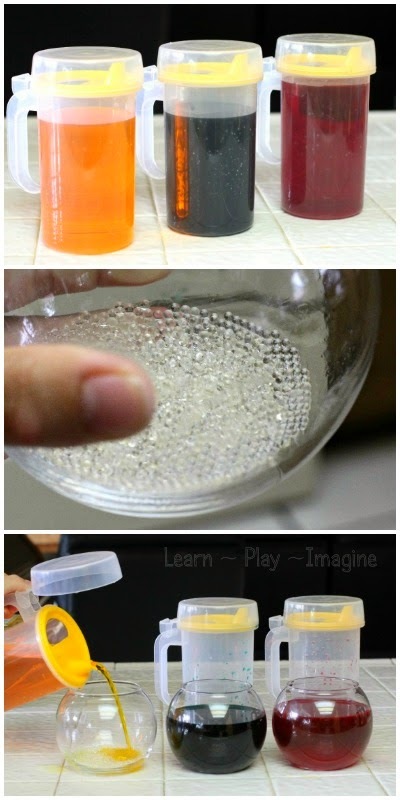 Adding scent and color to water beads is an easy way to make a season or theme specific sensory bin. Directions: I mixed liquid watercolor paint with water and put it in three containers, one yellow, one green, and one red. I sprinked cinnamon in with the green, vanilla in the yellow, and candy apple flavor in the red. I added about a tablespoon of clear water beads to each bowl. JZ (7) poured the colored water into each bowl of water beads. After a few hours the bowls were overflowing, and I had to transfer the water beads to larger containers and add more water. I started hydrating the water beads after breakfast, and by dinner time they were fully hydrated and ready for play. I poured all three colors of water beads into a bucket and invited the boys to join me outside. In addition to the bucket I provided a few extra bins and containers for scooping and dumping. Please note that water beads jump and bounce around quite a bit. If you play indoors I highly recommend using a bin with deep sides to contain all the beads. If a stray water bead or two rolls away it's not a huge concern unless you have animals or young children. The water bead will dehydrate when not in water and vacuum up easily the next time you clean. I love this idea... I can't wait to try it! Thank you for sharing! Where can I get water beads?